SIR Foundation provides many opportunities for those performing basic and clinical research. SIR Foundation proudly recognizes and funds outstanding member achievements in research and innovation. The SIR Foundation Gala is held annually to raise essential support toward advancing IR through research. SIR Foundation supports a robust portfolio of grant programs intended to encourage the development of interventional radiology research. SIR Foundation is involved in different research trials and clinical registries to evaluate specific outcomes for improving patient care. SIR Foundation greatly values and relies upon financial support from corporations to further its mission to advance the science and art of interventional radiology and promote community health, patient welfare, and public education in this medical field. Visit the Quality Initiative area to learn more about SIR and SIR Foundation's commitment to quality improvement in interventional radiology. All donations to SIR Foundation are channeled directly to programs and projects that perpetuate a strong and vibrant future for interventional radiology. SIR Foundation has created many ways to give to fit the needs of our donors. During his Dotter Lecture at SIR 2019, SIR Past President Alan H. Matsumoto, MD, FSIR, introduced a new SIR Foundation program to support diversity in IR by providing a travel grant for medical students from diverse backgrounds who desire to participate in a visiting clerkship in interventional radiology outside of their home institution. The Grants for Education of Medical Students (GEMS) Program is open to students who are seeking to be the first generation of physicians in their families and identify as being from racial or ethnic groups that are underrepresented in the medical field, female, or LGBTQ. Students who come from socioeconomically disadvantaged backgrounds are eligible to apply for these scholarships. SIR Foundation's Comparative Effectiveness Research (CER) Committee hosted a webinar on "Medical Imaging AI Research - Why Everyone Should Do It" on Wednesday, Feb. 13. Matthew Lungren, MD, PhD, a pediatric interventional radiologist, discussed basic principles, strategies, and approaches for leading a clinical AI research project. Your support of SIR Foundation funds breakthrough research, encourages and trains new and established investigators, ensures that innovation thrives, and continues the work that safeguards the foundation's future as a premier research resource. Thank you for making a difference in the lives of millions of interventional radiology patients worldwide. Join a group of visionary leaders who believe there are many discoveries yet to be made and have committed to giving generously to foster the passion of today’s young investigators who will deliver the future of IR. Donate today to become part of the Pioneer Circle. 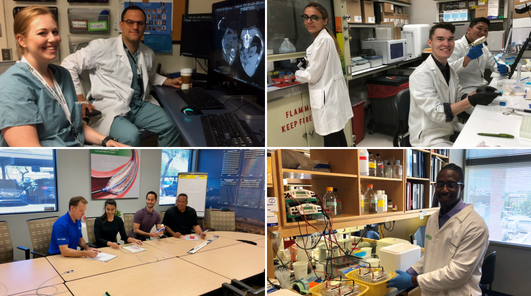 Medical students participating in the SIR Foundation Summer Medical Student Internship Program shared their experiences by taking over SIR's Instagram account last summer. Experience a day in the life of the summer interns.